Just like at the fair. We'll make real Pennsylvania Dutch Funnel Cakes at your event or party. In addition to the big 8" standard Funnel Cakes, we also can make a 3" Funnel Cake we affectionately call "Baby Cakes". 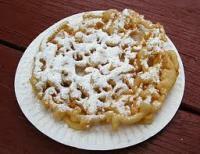 Also ask us about using Funnel Cakes as a fun raiser for your church or nonprofit. ALSO AVAILABLE - Funnel Cake Fingers - a totally new treat. Pricing based on your particular event specifics.